Souvenirs from Nizhni Novgorod: "I don't pay bribes" buttons. At our last business meeting, Moscow Friends talked about coming up with a brief page or leaflet for people who come to meeting for the first time. This introductory handout isn't exactly the same thing as the "signs" I mentioned in that earlier blog post, but as we've been thinking about what to say about ourselves to newcomers, that post, and the helpful comments that followed, came back to me. Moscow Friends have been around for over twenty years, meeting in a private apartment, the basement of a Russian Orthodox church, a school, the office of Friends House Moscow, and two rented meeting places. In most of those places, there was at least someone who had to let people in--visitors couldn't just enter directly and find a seat. However, the community center where we've been since January has no guard or attendant or doorbell (no doorbell--thank God!--people come anywhere from right on time to 55 minutes late); a visitor could just walk through the door and the first human beings they'd see would be the assembled meeting. Since we're an unprogrammed congregation, chances are they would see us simply sitting quietly, with no obvious leader and no obvious cues beyond welcoming faces, and perhaps hands motioning toward an empty chair. Imagine you've never ever experience traditional Quaker "waiting worship" or any analogue anywhere, and your understanding of a Christian gathering, whether from experience or just vague impressions, includes at least some form of liturgy and up-front leadership. Let's assume that you're a bit shy about sharing your spiritual uncertainties, or for that matter, your social uncertainties, with a group of total strangers--especially silent strangers. But you're probably not completely without information, probably gained from the same source that told you how to find us. So at least you know we don't bite. 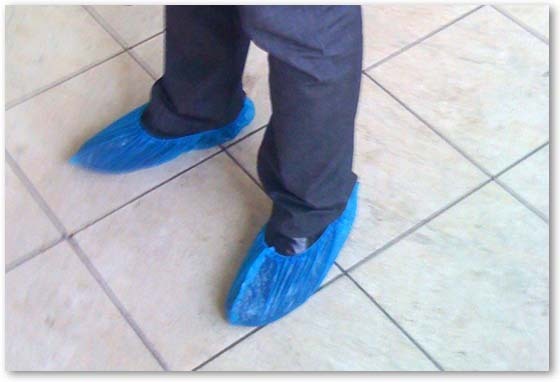 Once you're inside the door and have found the little blue plastic booties (бахилки) for you to put on over your street shoes, what should we communicate to you briefly that will give you the most hospitable path from the doorway to the seat? So ... when the need arises, one or more of us will emerge from the silence and communicate directly with the questioning or troubled newcomer. We've talked about having a greeter, but our meetings are sometimes so small and attendance varies so dramatically from week to week that we've been reluctant to take that step...especially if a simple printed text might provide that needed bridge of communication. The reincarnation incident reminded me of a story I heard from a member of Ottawa Meeting in Canada, concerning a time in that meeting's history when they gathered in a YMCA building. Apparently, an Alcoholics Anonymous group was meeting in a nearby room and found itself short of chairs. A couple of AA participants walked into the Friends meeting to borrow some chairs, and observed Friends sitting quietly with their heads down. One of the AA pair broke the silence to reassure the gathered Quakers: "There's nothing so bad that you can't talk about it." By the time I joined Ottawa Friends, they had their own meetinghouse, with a literature table on the path to the meetingroom. On the table was a little leaflet with the perfect title, "Your first time in a Quaker meeting?" That leaflet, somewhat updated, has in fact been translated into Russian. I think its current English-language incarnation is here (in PDF form). So this leaflet (Russian version) gives us one text to draw on. An old friend of mine, Virginia Schurman, wrote another text, "Welcome to Friends Meeting for Worship," that I love very much for its brevity and reverence. It's been published by the Tract Association of Friends and is available here. Link to downloadable PDF version. There have been several blogs covering the Conference; one of the most comprehensive reports I've found is here. A Christian blogger who receives between 400 and 700 comments weekly writes "Ten Tips for Dealing with Online Criticism." Just in case you're in the same boat ... which I'm not! Speaking of comments, Mona Eltahawy's Foreign Policy article on misogyny, "Why do they hate us? ", has received (at the moment) 2,160 of them. Today I listened to her responding to comments by blogger Mona Kareem on a BBC Global News podcast (here, starting at 17:14; podcast is available for 30 days). The heart of the discussion is a crucial dilemma for evangelists and missiologists (although that's not the context of their exchange): when does prophetic truth trump cultural integrity, if ever, and how do we know? Back in March, I linked to quaker oats live's "biking experiment." Now, here's her report. Teaser: "Partially, this experiment was just humbling. I don't tend to think that we drive that much, but keeping track for a month really made me aware of how much we just randomly decide, "Hey, let's go do such-and-such," of an evening or weekend, and we just go do it." What does the Very Worst Missionary say about our dear Portland, Oregon? One day last week, a friend called us to say "The sky's turned green!" We looked outside--she was right! Our instant reaction, having lived in the midwestern USA for many years, was to say "Get inside and down to the basement!" But it wasn't a tornado. "Because we are the army." A May Day heartbreak. Thanks so much for your blog. I look forward to reading it every week. Thanks, too, for including the text of the statement on peace and ecojustice. It's a wonderful document. I've seen the Kabarak statement reprinted in a number of places. So many people took part in the global change conversations organized by FWCC over the past couple of years, I'm grateful that the conference could come up with a good distillation.